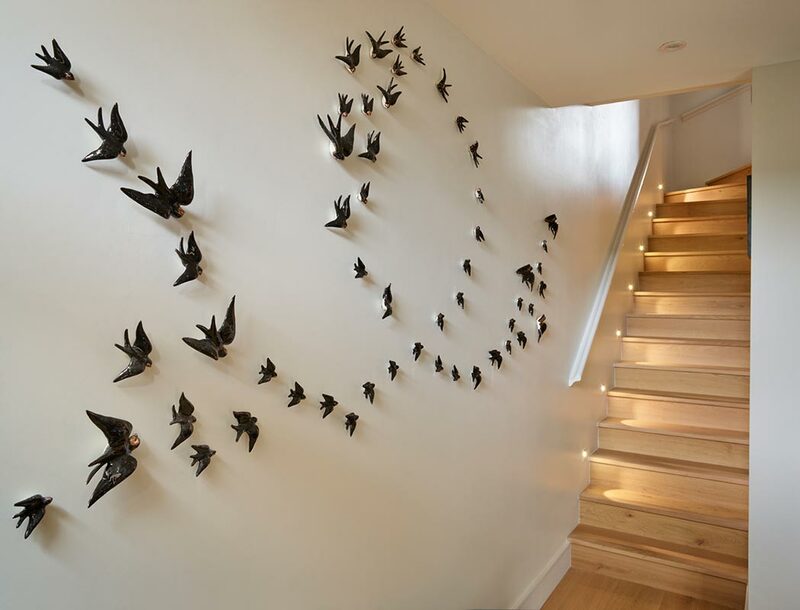 Arrangement of 55 ceramic swallows to look in flight up this staircase. A dramatic feature for this entrance hall. 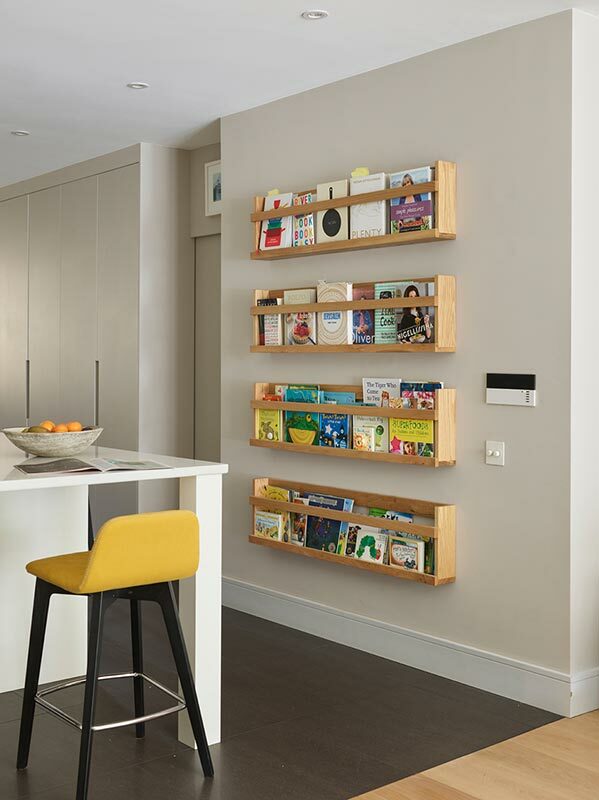 Recipe book holder feature wall designed by Ensoul Bespoke. Form and function in this contemporary kitchen. 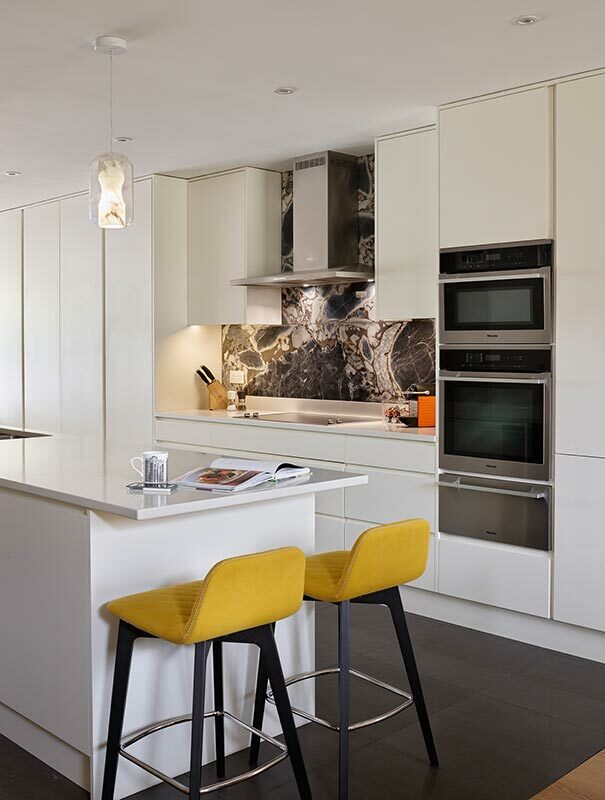 Marble feature splashback hand selected for this project; Lee Broom pendant lights and bright mustard stools are the heroes in this kitchen scheme. 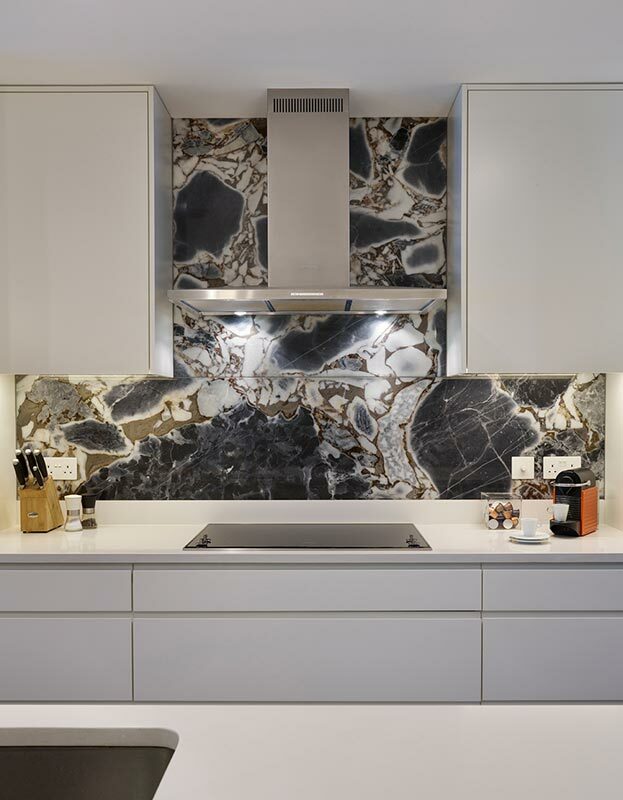 Stunning bookmatched marble splashback, hand selected to make a real feature in this contemporary kitchen. Formal dining area within a large open plan space with metallic 3d wallpaper, rich gold and navy curtains, upholstered dining chairs and simple but highly effective pendant light. 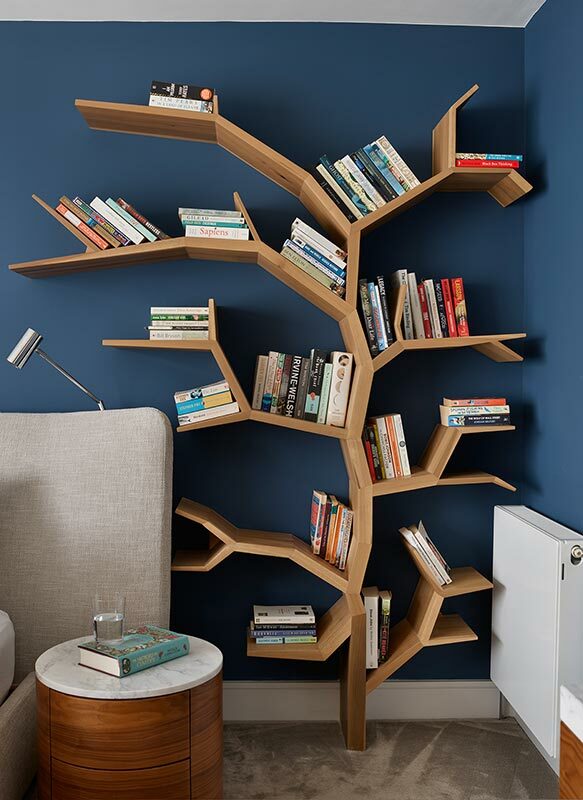 Beautifully lit sculpture is the highlight of this open shelving unit. 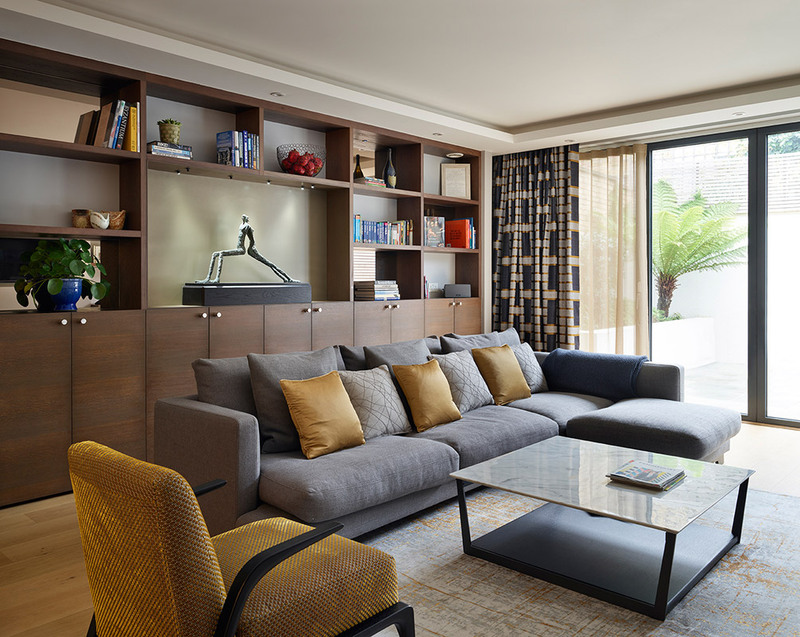 The room is softened by lots of fabric: gold and navy curtains with gold sheers behind, metallic gold and silver rug, upholstered lounge chair and sofa with plenty of scatter cushions. 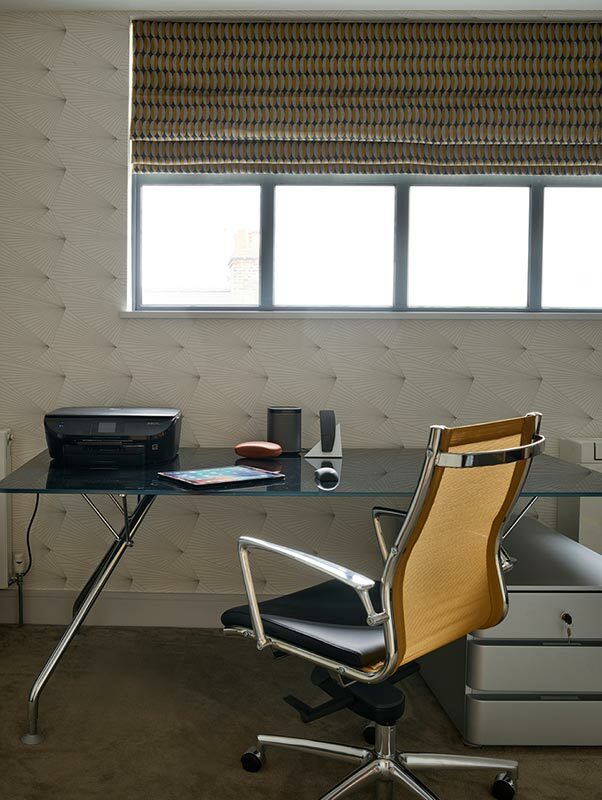 Mustard, black and grey home office featuring a wallpaper which resembles bicycle spokes to match one of our client's passions. Black glass desk and black and mustard leather chair with strong statement Roman blind. 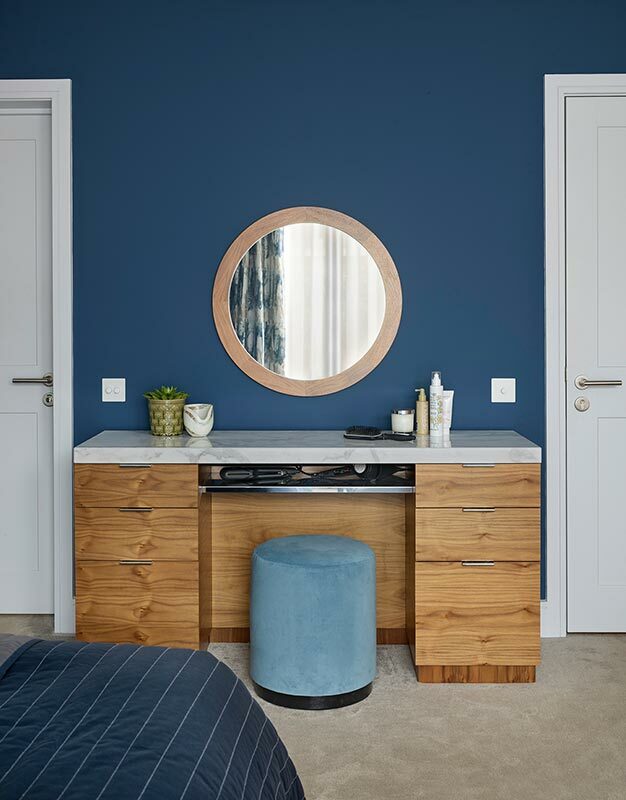 Master bedroom featuring lots of our Ensoul Bespoke furniture. Oak tree bookcase, walnut and Calacatta marble bedside tables and leather and stainless steel bench all designed and produced by Ensoul. 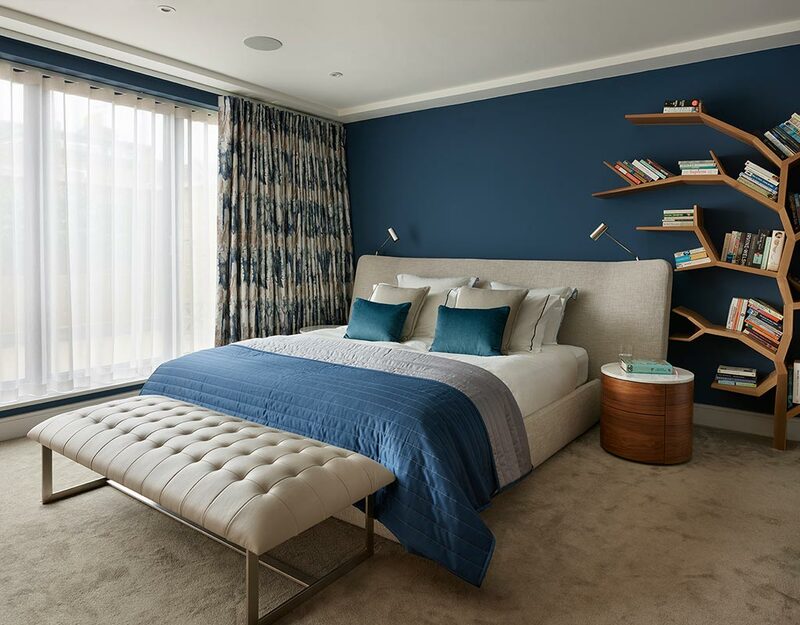 Upholstered bed and beautiful soft furnishings soften the look. 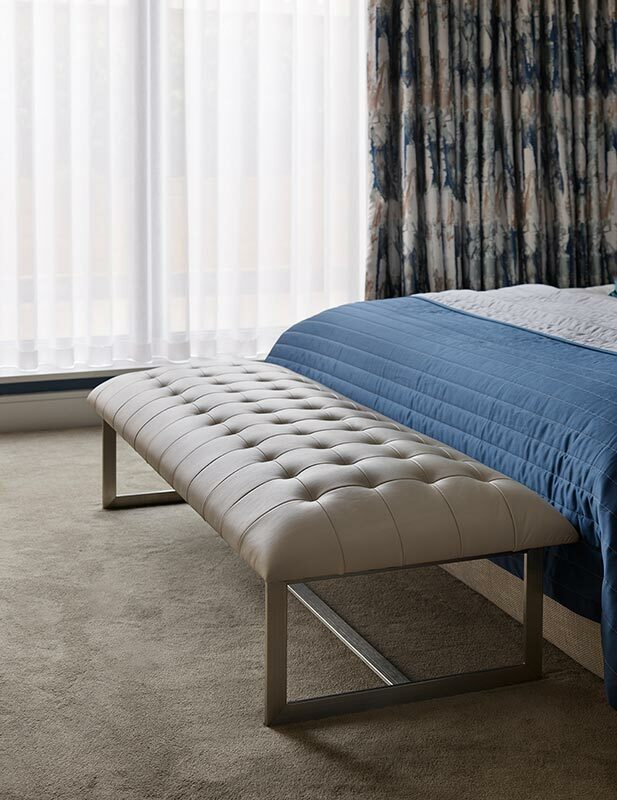 Leather bench at the foot of this master bed designed by Ensoul Bespoke. 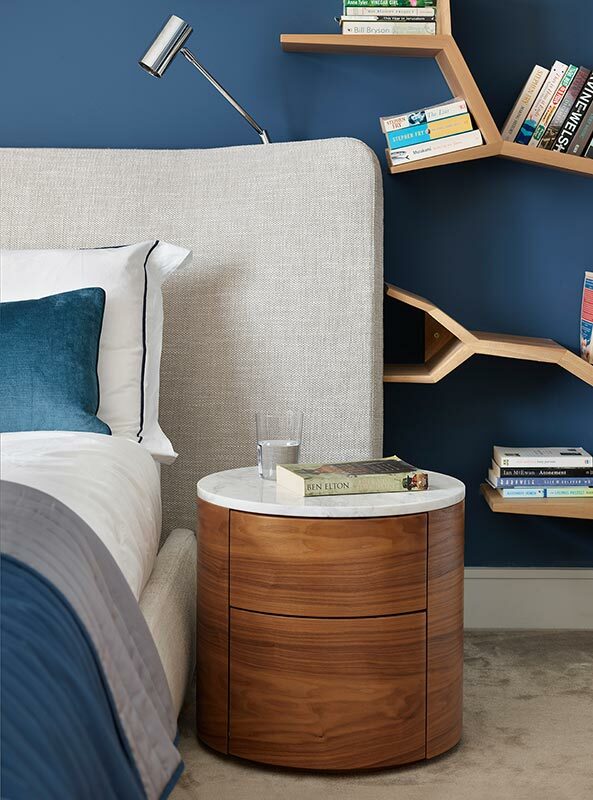 Master bedroom featuring a statement tree bookshelf and walnut and Calacatta marble bedside tables both designed by Ensoul Bespoke. Walnut and Calacatta marble dressing table designed by Ensoul Bespoke. 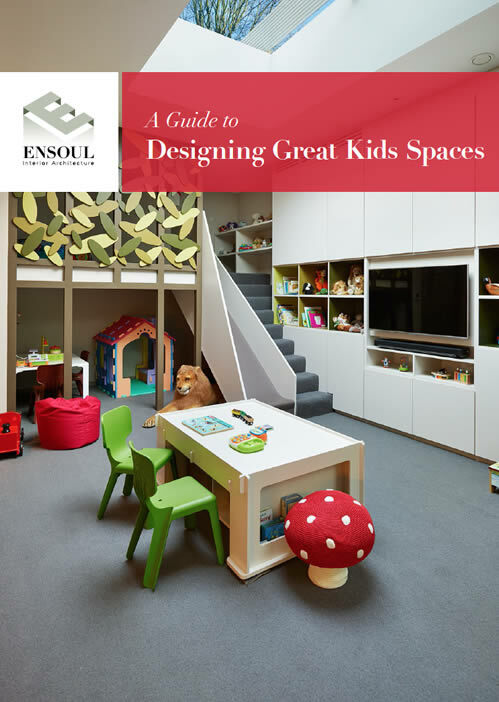 Nursery designed for our clients' first newborn. Jungle themed mural and matching storage boxes for plenty of toy storage. A tribute to our client's passion for cycling. 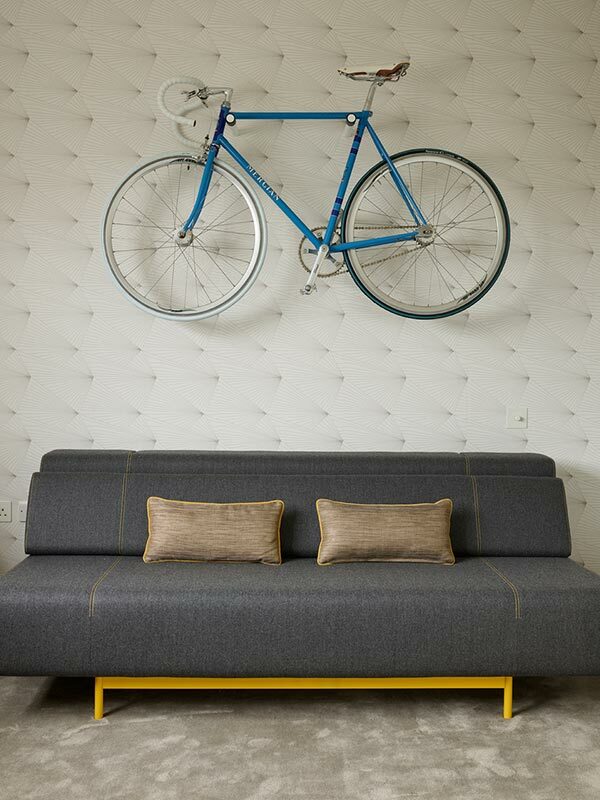 We used a wallpaper which resembles spokes and mounted a beautiful and very prized bicycle above a sofa bed in his home office / guest bedroom. 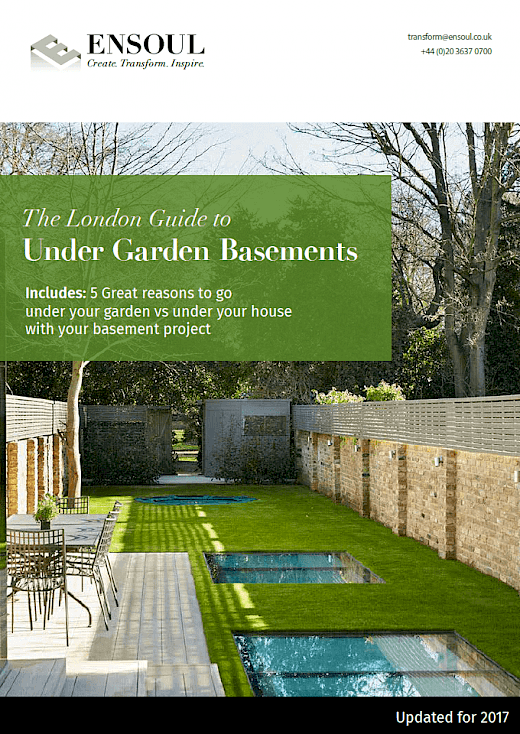 Our brief was to transform a very neutral property into a striking home with lots of special features and personal touches. Introducing lots of special wall features, from wallpaper to murals, a suspended bicycle and 55 ceramic swallows in flight. 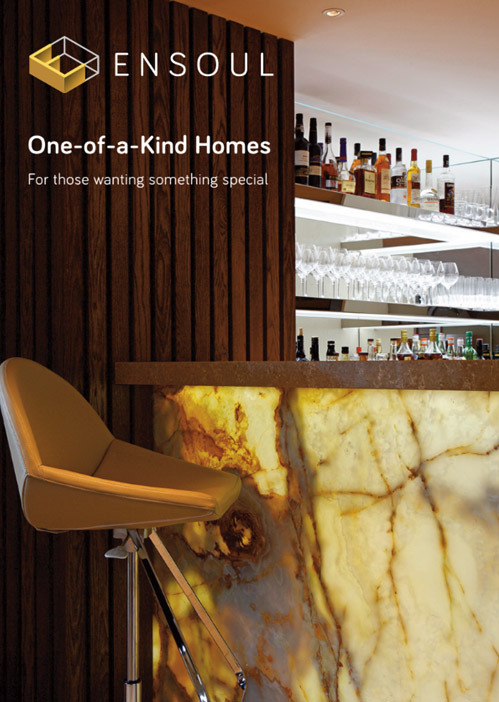 Lots of bespoke furniture designed By Ensoul. Soft furnishings throughout: curtains, blinds, bespoke headboards, cushions.